IGCAT international experts Dr. Edith Szivas (UK) and Prof. Roberta Garibaldi (Italy), accompanied by Dr. Diane Dodd, President of IGCAT, visited Kuopio (Finland) on 13 June 2017, in representation of the jury called to evaluate Kuopio’s bid for the European Region of Gastronomy 2020 title. The small delegation had the opportunity to meet different local stakeholders and assess the progress made by the region towards the award. Jury representatives were first welcomed by Antti Iire and Jari Linden at Savonia University of Applied Sciences, where they had the chance to discuss Kuopio Region Programme and meet the Hospitality School staff. Possibilities were also explored for Kuopio to host in its title year both the first European edition of the Innovative Souvenir Award and 2020 European Young Chef Award. In addition, Minna Kuuluvainen from the City of Kuopio and Project Manager of KierRe Project introduced the Network of Finnish Sustainable Communities (FISU), committed to working towards a carbon neutral and waste-free future and curbing overconsumption by 2050. 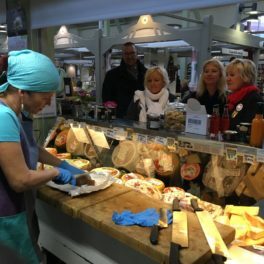 A visit followed to seven local micro and small food enterprises at Kuopio Market Hall and Market Place with official guide of the City of Kuopio, Helena Lehtoaro. And after a lunch at Puijo Tower with Kari Virranta, Director General of Pohjois-Savo’s Centre for Economic Development, Transport and the Environment, and Ari-Pekka Parviainen, from La Chaîne des Rôtisseurs, the experts stopped at Koivumäki Manor House, where CEO Sari Mielonen and chef Harri Ruutiainen guided them through a tasting experience of local products. Susanna Hotari, from Ruukkumaa, Sanna-Riikka Nissinen, from Haapaniemen Matkailu, dancer Laura Rukola and Special Techniques expert Kaija Honkanen welcomed then the jury delegates at the Creative Tourism Cluster, where they participated in a wild herb workshop at, organised by Benestatera wellbeing company and held by Milla Becquerel. The visit continued with a motor ship cruise to the City Harbour hosting Antti Hynninen, Marketing Manager of Gust Ranin / Lignell & Piispanen and concluded at Restaurant Musta Lammas, where the international experts met Satu Vehreävesa, Director of Regional Development at the Regional Council of Pohjois-Savo and Juhani Simpanen from La Chaîne des Rôtisseurs. Delegation members were impressed with all the activities they witnessed to during the jury visit and noted that Kuopio is an undiscovered treasure that has significant potential to develop a balanced and positive sustainable tourism model. Also, the region has many innovative food and beverage products that have enormous value for both tourism, locals and for wider export. The visit immediately preceded the presentation of Kuopio Region’s bid book to the jury, held on 14 June 2017 at Kuopio City Hall. IGCAT is a non-profit organisation established in 2012 working in the fields of gastronomy, culture, arts and tourism. Through its worldwide network of experts, IGCAT aims to empower local communities by guiding, facilitating, and supporting local leaders in cities, regions and cultural projects to understand the potential of their distinct food, culture, arts and sustainable tourism assets. IGCAT is the official secretariat for the Region of Gastronomy Platform and provides the European Region of Gastronomy Award, the European Young Chef Award and the Innovative Food Souvenir Award.